* In the early 1960s, Britain and France began a collaboration to build a new trainer / strike aircraft. After some difficulties, this machine finally emerged as the SEPECAT “Jaguar”, which provided excellent service for decades in the air forces of Britain, France, and several other nations. This document provides a history and description of the Jaguar. * While military aircraft often have complicated origins, the story of the birth of the Jaguar is an extreme case. In 1957, British Defense Minster Duncan Sandys (pronounced “Sands”) published a white paper that stated the day of the manned combat aircraft was over, and the future belonged to guided missiles. In the wake of the “Sandystorm”, many promising British aircraft development projects were canceled, and British Royal Air Force (RAF) officers began to wonder if they would all be out of jobs soon. Sandys had greatly overestimated the capability of contemporary guided missile technology — though he could be forgiven to a degree because his point of view was not all that unusual at the time, with both the US and the USSR scaling back important aircraft programs in favor of missiles. Furthermore, in the wake of the ill-fated Anglo-French-Israeli seizure of the Suez Canal the year before, the British Empire was in its last phase of disintegration, and there was an obvious need to streamline and rationalize the British aviation industry. Unfortunately, the result was less of a soft landing than a crash that left wreckage strewn all over the landscape. Some projects did manage to survive the “Sandystorm”. By the early 1960s, a backlash of sorts had emerged, with officers and defense officials now brave enough to question that the day of the manned combat aircraft was really over. New aircraft development proposals began to emerge, if timidly. 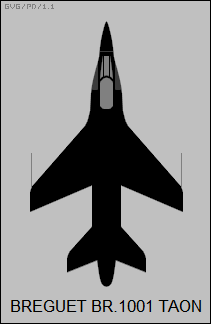 One of these proposals congealed in 1962 as “Air Staff Target 362 (AST.362)”, which specified an advanced jet trainer to replace the Folland Gnat T.1 and the Hawker Hunter T.7. The trainer was also to serve as a light tactical strike aircraft. The British Aircraft Corporation (BAC, later the core of the modern British Aerospace / BAE Systems organization) came up with a design for the requirement designated the “P.45”, featuring twin afterburning Rolls-Royce RB.172 engines, then in design, and a top speed of Mach 1.7. Proposals were one thing, commitment and funding another, and the money was not forthcoming. However, the French government was also casting about for a new trainer with secondary strike capabilities, which emerged in parallel with AST.362 as a requirement for the “Ecole de Combat et Appui Tactique (ECAT)”. The ECAT was to replace the Fouga Magister and Lockheed T-33 in the training role for the French Armee de l’Air (AA), and the Dassault Super Mystere B.2, Republic F-84F, and North American F-100 in the attack role. These parallel requirements led to discussions between the two nations for a collaboration on a single aircraft to meet the needs of both, with a provisional joint specification released in March 1964, followed by a refined specification in October 1964. British politicians liked the idea of a collaborative program as a means of improving relations with the French and gaining a foothold into the European Common Market. The meeting of minds was not exactly a perfect fit. There was uncertainty on both sides over the relative priorities of trainer versus strike requirements, and so discussions led the two sides to propose two collaborations, one based on the ECAT that would serve as a trainer for the RAF (and possibly the Royal Navy) and as a trainer / light strike aircraft for the ADA; and a more formidable dedicated strike fighter with “swing wings” for both the RAF and the AA, designated the “Anglo-French Variable Geometry (AFVG)” aircraft. A decision to proceed on these two collaborative efforts was formalized in a “memorandum of understanding (MOU)” signed on 17 May 1965. As far as the trainer / light attack aircraft went, the initial agreement envisioned that the RAF would obtain 150 advanced trainer variants, while the AA would obtain 75 trainer variants and 75 light attack variants. The name “Jaguar” was announced for the new aircraft in June 1965. The British trainer was designated “Jaguar B (Biplace)”, while the French trainer was designated “Jaguar E (Ecole)” and the French light attack aircraft was designated “Jaguar A (Appui)”. * In May 1966, Breguet Aviation of France and British Aircraft Corporation (BAC) formed a joint company to build the new aircraft. The collaboration was named “Societe Europeanne de Production de l’Avion Ecole de Combat et Appui Tactique”, blessedly abbreviated as “SEPECAT”. The AFVG was to be built by a collaboration between Dassault and BAC. The baseline for the Jaguar was the Breguet “Br.121”, an unflown design for a light strike aircraft that was a follow-on to the Breguet “Br.1001 Taon (Horsefly)”. The Taon had been built for a NATO requirement (the name was in fact an anagram of “NATO”), with two prototypes built, the first performing its initial flight on 25 July 1957. It had a span of 6.8 meters (22 feet 4 inches), a length of 11.68 meters (38 feet 4 inches), and an empty weight of 3,425 kilograms (7,550 pounds). The prototype was powered by a Bristol Orpheus BOr.3 turbojet with 21.6 kN (2,200 kgp / 4,850 lbf) thrust and was marginally supersonic. The NATO requirement had actually been won by the Fiat G.91 fighter, and the Taon never went into production. The engine for the Jaguar was also to be built by an Anglo-French consortium. Rolls-Royce of the UK was to merge their RB.172 engine design — which the French had selected for the Br.121 — with that of the T-260 Turbolet produced by Turbomeca of France, resulting in an afterburning bypass turbojet designated the “RT-172 Adour”. However, the Br.121 design defined a machine of modest capability, with a combat load of only 590 kilograms (1,300 pounds) and a limited combat radius. The British wanted something more formidable and pushed the project in that direction, with BAC changing the design to a bigger and more powerful aircraft. This was a little strange in hindsight because the original British requirement was only for trainers; it appears that the “mission creep” in the Jaguar program was due to RAF insecurity created in the years following the “Sandystorm”, in which one British advanced aircraft project after another took it in the neck. The RAF wanted to have more options in case other branches of aircraft development ran into dead ends. The French felt the changes in definition would lead to delays in delivery and they would be proven right, but they were also tempted by the revised machine’s improved capability and went along with the British. Whatever the reasons for the British push for a more capable combat aircraft, the change in direction would prove justified when the French killed off the AFVG in June 1967, citing lack of funds. The British were thoroughly annoyed when they found out that the funding shortfall was due to the fact that the French government had transferred the money to another Dassault program, the “Mirage G”, which was very much along the lines of the AFVG but was purely French. The Mirage G would eventually be axed as well, which didn’t make the British any happier with being snubbed. In any case, on 9 January 1968 the British and French governments signed a second MOU on the Jaguar, with both countries committing to the purchase of 200 aircraft each. The British would obtain 110 Jaguar B trainers and 90 single-seat “Jaguar S (Strike)” strike fighters. 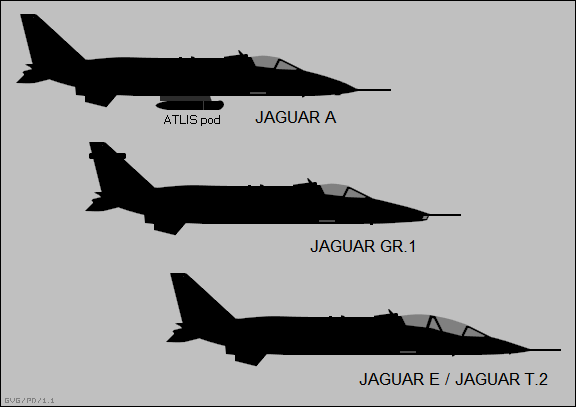 The AA would still obtain 75 Jaguar Es and 75 Jaguar As, but the French naval air arm, the Aeronavale, would obtain 10 Jaguar Es and 40 examples of a carrier-capable Jaguar single-seat strike variant, the “Jaguar M (Marine)”. The first French Jaguar E two-seat trainer prototype performed its initial flight on 8 September 1968, this also being the first flight of the Adour engine. The first French Jaguar A single-seat strike variant prototype flew on 23 March 1969. The first RAF Jaguar S single-seat strike variant prototype flew on 12 October 1969. The first RAF Jaguar B two-seat trainer variant prototype followed on 30 August 1971. Two prototypes were built for each of the four variants, giving a total of eight, with five of the prototypes built in France and three in the UK. A single prototype of the Jaguar M carrier-based strike variant for the Aeronavale — with a longer nosewheel leg, stinger arresting hook, and other navalizations — performed its initial flight on 14 November 1969. The Jaguar M completed carrier deck trials before being canceled in favor of the Dassault Super Etendard. This has been generally judged a bad move on almost all counts. 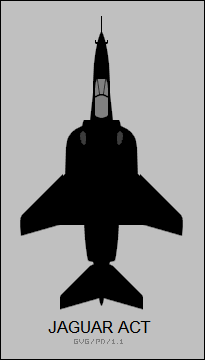 The Super Etendard was clearly less capable, but it was sold as a modest low-cost update of the existing Etendard IV, and though the “modest” part turned out to be arguably true, the “low-cost” part turned out to be unarguably false. Some authors have poked fun at the evaluation report on the Jaguar M versus the proposed Super Etendard, which is said to have criticized the Jaguar M’s handling with an engine out — somewhat oblivious to the fact that since the Super Etendard only had one engine, its engine-out performance clearly would leave even more to be desired. In any case, the AA picked up the other 50 Jaguars ordered by the Aeronavale. The other four variants all went into production, with initial production aircraft flying in 1972 and the type migrating into AA and RAF service over the next few years. The AA retained the designations of “Jaguar A” for the single seater and “Jaguar E” for the two seater, but the RAF single seater Jaguar S became the “Jaguar Ground Attack / Reconnaissance Mark 1 (GR.1)”, while the two seater Jaguar B became the “Jaguar Trainer Mark 2 (T.2)”. Production workshare was split 50:50 between the contractors, with BAC building the wings, engine intakes, rear fuselage, and tail assembly, while Breguet built the nose, center fuselage, and landing gear. There were final assembly lines in both countries to build their respective national variants, with BAC rolling out Jaguars at Warton and Breguet producing them at Colomiers, near Toulouse. Rolls-Royce and Turbomeca had a similar arrangement, each building half of the Adour engines, with Rolls completing British Adours at Derby and Turbomeca turning out French Adours at Tarnos. The Jaguar was the first Anglo-French combat aircraft, and said to be the first RAF aircraft to be designed in metric. It would go on to prove a valuable asset to all the air forces that operated it. The fact remained that the Jaguar didn’t really answer the requirements for which the program had been originally established, and these requirements remained outstanding. The RAF would eventually acquire the sophisticated strike aircraft sought in the AFVG effort as the Anglo-German-Italian Panavia Tornado, and an advanced jet trainer in the form of the BAE Hawk. The French would acquire the trainer / light-attack aircraft in the form of the Franco-German Breguet-Dornier Alpha Jet. * The French Jaguar A single-seater was of generally conventional configuration and had clean, if somewhat angular, lines. It was built mostly of aviation aluminum alloys, with selective use of titanium. There were no major composite assemblies. The aircraft was designed to be easy to maintain under austere field conditions, with no need for a ladder to reach most routine maintenance points. There were five internal fuel tanks, with one in the front, center, and rear of the fuselage and one in each wing, providing a total fuel capacity of 4,180 liters (1,102 US gallons). The Jaguar’s handling was generally regarded as good, and it was said to be a fine aerobatic aircraft when flown in a clean condition. The Jaguar A had a high-mounted wing with a sweep of 40 degrees and an anhedral droop of 3 degrees, with relatively small wing area for a smoother ride at low altitude. There was a leading-edge flap along the outboard section of each wing, and large, double slotted trailing edge flaps on both the outboard and inboard sections of each wing. There was a “dogtooth” between the outboard and inboard sections of the wing. There were no ailerons, roll control being provided by a two-section spoiler on top of each wing, just forward of the outboard flaps. There was a prominent “fence” between the inboard and outboard sections of the wing. Along with a conventional tail assembly, with all-moving one-piece tailplanes, there were two ventral fins. There were twin hydraulically-operated perforated airbrakes ahead of the ventral fins, under the wings. The hydraulic system was dual-redundant. Early Jaguar As were powered by twin Adour 101 engines with 32.5 kN (3,310 kgp / 7,300 lbf) afterburning thrust each, but the Adour 101 was quickly replaced by the Adour 102 variant, with the same thrust levels but a modified afterburner system. The problem with the Adour 101 was that it would only go into afterburner at max RPM, but this made things dicey if a pilot had to break off a landing approach for another go-round if an engine was out: the remaining engine would be throttled-down, making it difficult to obtain afterburning power to get back up in the air fast again. The Adour 102 had an afterburner that could be engaged at 85% RPM. All British Jaguars were delivered with Adour 102s. The engine inlets were mounted high on the fuselage, reducing risk of foreign object ingestion on rough fields, and had fixed inlets, though there were twin tandem spring-loaded suction relief doors on the side of each inlet to provide greater airflow for ground running. The Jaguar A used ruggedized landing gear for rough-field operation, with single-wheel nose gear and twin-wheel main gear, all fitted with low-pressure tires. The nose gear retracted backward and the main gear retracted forward, rotating 90 degrees to tuck flat in the fuselage, a procedure that must have been interesting to watch. The Jaguar also featured a runway arresting hook between the engine exhausts, and a brake chute in the tailcone. The brake chute could be replaced by a chaff-flare countermeasures dispenser. The pilot sat in an air-conditioned and pressurized cockpit on a Martin Baker Mark 4 ejection seat, under a clamshell-style canopy that hinged open to the rear. The windscreen was made of armor glass. The Mark 4 ejection seat could only be used at ground level at speeds in excess of 165 KPH (90 knots) and was referred to as a “zero-ninety” seat. Some sources claim, though it’s disputed, that a number of French Jaguars were later refitted with Martin-Baker FB9 seats, which were true “zero-zero” ejection seats that could be fired on the ground when the aircraft was standing still. All other national users selected the FB9 seat from the outset. There was a noticeable intake for the aircraft cooling system just behind the cockpit. Avionics included simple navigation kit, including a Decca Doppler navigation radar, license-built in France; a Thompson-CSF head-up display (HUD); fire-control electronics; identification friend or foe (IFF) system & radio gear; and a CFTH-built radar warning receiver (RWR), with discreet receiving antennas in the top of the tailfin and in the wingtips. An OMERA 40 panoramic camera, fitted in a tidy fairing just under the nose, was introduced early in production, and midway through production it was joined in the fairing by a TAV38 laser rangefinder. Jaguar A aircraft that initially lacked the camera and the laser rangefinder were retrofitted with it. The Jaguar A’s built-in armament consisted of twin 30 millimeter French DEFA 553 cannon with 150 rounds per gun, firing out from the “corners” of the fuselage behind the cockpit. The cannon had a rate of fire on 1,300 rounds per minute each, and could be fired together or separately. There were two stores pylons on each wing and one under the centerline, for a total of five. The centerline and inboard pylons were rated at 1,130 kilograms (2,500 pounds) each, while the outboard pylons were rated at 565 kilograms (1,250 pounds) each. Total stores load was 4,540 kilograms (10,000 pounds). The centerline and inner wing stores pylons were “wet” and could be used to carry up to a total of three external RP36 tanks, with a capacity of 1,187 liters (313 US gallons) each. A retractable inflight refueling probe was fitted on the right side of the nose. Typical stores loads included iron bombs; Belouga or other cluster munitions; SNEB 68 millimeter unguided rocket pods; external fuel tanks; and air to air missiles (AAMs) such as the Matra Magic. Two squadrons were equipped with the AN-52 25-kilotonne tactical nuclear weapon. Other French Jaguar stores include the Martel anti-radar missile and its follow-on, the Armat; and the last 30 Jaguar As were fitted to carry the Atlis laser-target designator pod on the centerline, for guidance of French BGL laser-guided bombs and the AS-30L laser-guided missile. Jaguar As could also carry the RP63P centerline reconnaissance pod, which was a modified drop tank fitted with one forward-looking and two side-looking film cameras. Some sources claim the pod also retained a partial fuel storage capability, which seems plausible given that the three cameras wouldn’t take up that much space. Countermeasures gear included a variety of jammer pods, such as the ESD Barax countermeasures pod; the Phimat chaff-flare dispenser, carried on an outer wing pylon; and neatly faired Alkan chaff-flare dispensers under each wingroot. As mentioned, a dispenser could also be carried in the tailcone. * The French Jaguar E two-seater was longer than the Jaguar A, with a length of 17.53 meters (57 feet 6 inches), and had the same powerplants, but reduced avionics kit and no retractable inflight refueling probe, though some were fitted with a fixed probe. The rear seat was raised by 38 centimeters (15 inches) to give the back-seater a better forward view. * A total of 160 Jaguar A strike aircraft was delivered to the AA from 1973. At its peak, the Jaguar equipped nine AA squadrons. The AA obtained 40 two-seat Jaguar Es, for a total of 200 Jaguars of all types. They were initially delivered in dark green / dark gray camouflage with flat silver undersides. The French found the Jaguar very handy for their running string of interventions in Africa. The aircraft was very capable, rugged, easy to maintain, and could be operated off of rough airstrips under primitive conditions. For desert combat, they were repainted in “sand and chocolate” disruptive camouflage. AA Jaguars were the first to fire shots in anger, operating from Dakar, Senegal, beginning in December 1977 to perform attacks on Polisario insurgents fighting against the Mauritanian government. Jaguars were then deployed to Chad in the spring of 1978 to perform strikes on Libyan-backed insurgents. After a political settlement in 1980, the French pulled out, only to return in 1983 and remain for a year when the fighting broke out again. In 1986, the French returned once more to deal with an air base that the Libyans had built to support insurgent forces at Wadi Doum, in occupied northern Chad. AA Jaguars attacked the air base on 16 February 1986 with BAP-100 runway cratering bomblets, leaving a major mess behind. The Jaguars came back again on 7 January 1987, using Martel anti-radar missiles to hand out a similar rough treatment to Libyan radar stations around Wadi Doum. AA Jaguars, painted in two-tone sand camouflage, also served very well in the First Gulf War, with the AS-30L laser-guided missile proving lethally accurate and effective. AA Jaguars performed over 600 combat sorties during the active air war. No air-to-air kills were scored. One AA Jaguar was damaged by a surface-to-air missile; it limped back to base, but had to be shipped home on a cargolift aircraft. After the Gulf War, the numbers of Jaguars in AA service began a gradual decline. The nuclear strike role was dropped in September 1991, with that task taken up by the Dassault Mirage 2000N. The Jaguar did serve in French actions over the Balkans during the “wars of the Yugoslav succession” in the 1990s, but by 2001 it had been completely retired. * The RAF Jaguar GR.1 was of course physically similar to the French Jaguar A, but there were many detail differences. The British aircraft had a different avionics suite, and was fitted with British ADEN Mark 4 30 millimeter revolver cannon instead of the French DEFA cannon. The two cannon, though distinct, were very similar, both firing the same ammunition and both derived from World War II German Mauser design efforts. The Jaguar GR.1 had more capable attack avionics kit than the Jaguar A, initially including the leading-edge (for the era) Marconi-GEC 920ATC “Navigation & Weapon Aiming Sub System (NAVWASS)” that provided flight direction and targeting data on a HUD; a look-down moving-map display; a Marconi ARI81223 RWR, with a distinctive rectangular antenna on the tailfin; and a Ferranti ARI23231 “Laser Rangefinder & Marked Target Seeker (LRMTS)” mounted in the nose, giving the GR.1 a “chisel nose” appearance different from the “pointy nose” French Jaguar A. The LRMTS was not actually fitted in initial production aircraft, but it was later retrofitted to all GR.1s. The Jaguar GR.1 could carry 4,765 kilograms (10,500 pounds) of stores, including external tanks, iron bombs, cluster bombs (particularly the potent Hunting BL755 cluster bomb), rocket pods, and US-built AIM-9 Sidewinder AAMs for self-defense. Oddly the British, despite their enthusiasm for the Jaguar, were slow in comparison to the French to qualify precision-guided munitions on the type. Other stores included a WE177 tactical nuclear store and a BAC-built centerline reconnaissance pod. The pod featured a forward-facing film camera in the nose, a horizon-to-horizon fan of four film cameras in the middle, and a stabilized, steerable Hawker-Siddeley Type 401 infrared linescan imager in the rear. Two of the center cameras could be swapped out for two wide-angle vertical survey cameras. Countermeasures included the US-made AN/ALQ-101 jammer pod, carried on an outer wing pylon, and the Phimat chaff pod, carried on the other outer wing pylon. Later on, two US-built AN/ALE-40 chaff-flare dispensers were scabbed on to the lower fuselage. 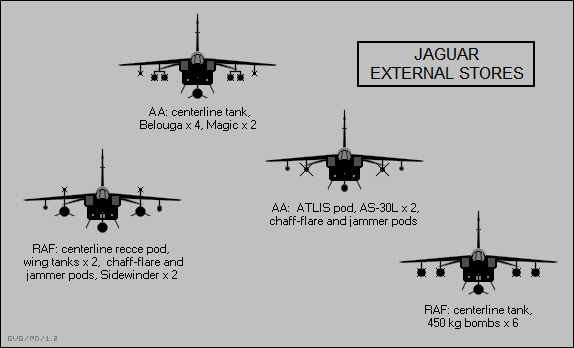 Jaguars usually operated in flights of four, with two aircraft carrying jammer pods and two carrying Sidewinders. * The RAF Jaguar T.2 trainer was externally similar to the AA Jaguar E. The T.2 had a subset of the GR.1’s avionics, for example lacking the RWR, and only the right cannon was fitted. It was not regarded as combat-capable. The fixed flight-refueling probe fitted to some AA Jaguar Es was not fitted to any RAF Jaguar T.2s. * A number of Jaguars were used for test and trials purposes, the most noticeable being the “Jaguar Active Control Technology (ACT)” demonstrator, a modified Jaguar S used to demonstrate reduced-stability / high-agility flight with a quadruple-redundant digital “fly by wire (FBW)” control system. The initial flight of the machine with the FBW system was on 20 October 1981. Ballast was then added to the tail to destabilize it, and in 1984 it was fitted with oversized leading-edge “strakes”, performing its first flight in this configuration on 15 March 1984. The Jaguar ACT was not intended as a prototype of an improved Jaguar, instead being intended as a technology testbed for the “Experimental Aircraft Program (EAP)” demonstrator, a British-built machine that would more or less lead to the Anglo-German-Italian-Spanish Eurofighter multi-role fighter. * The British bought a total of 203 Jaguars, divided into 165 Jaguar GR.1s and 38 Jaguar T.2s. The three additional T.2s, beyond the 35 actually put in RAF service, were reserved for test and trials duties, and it appears that at least some of the four UK prototypes ended up in test and trials service as well. The initial color scheme in RAF service was dark gray / dark green disruptive camouflage with a light gray belly, though temporary color schemes were adopted when necessary, such as white-and-green patterning for exercises in wintry Norway. The Jaguar replaced the F-4 Phantom in the RAF low-level strike role. While RAF pilots missed the sheer massiveness of the Phantom and its heavy warload, the Jaguar was fine machine, optimized for low-level flight and capable of precision attack, as well as operation from rough airstrips. It was not as good a solution for all-weather operation and there were frustrating limitations on strafing and dive-bombing for a while that irritated RAF pilots, but it was much more survivable than the powerful but notoriously unmaneuverable Phantom. At its peak in the strike role, the Jaguar was the backbone of RAF tactical aviation in Central Europe, comprising four tactical nuclear strike squadrons, three conventional tactical strike squadrons, and a tactical reconnaissance squadron. 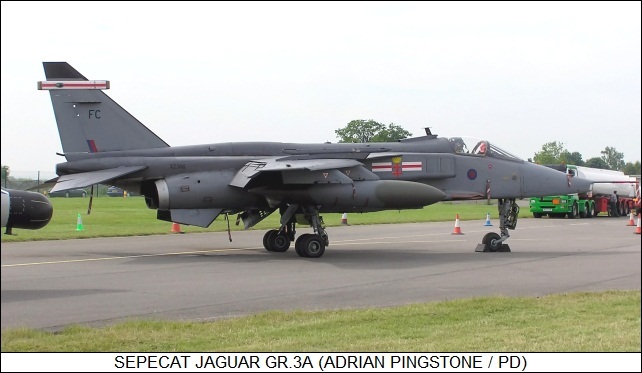 The Jaguars began to be partly displaced by the Panavia Tornado in the mid-1980s, which took over roles such as nuclear strike, but the Jaguar still remained in frontline service. * The RAF upgraded their Jaguars from the early days of its service. Beginning in 1983, British Jaguars were refitted with an improved Ferranti FIN 1064 navigation system, featuring an inertial navigation system (INS) plus a new computer and power supply, in place of the NAVWASS. The FIN 1064 was much more compact than NAVWASS, with one black box replacing five, and far more accurate and capable. Mission data could be programmed into the FIN 1064 by plugging in a memory module. Upgraded aircraft were given the designations “GR.1A” and “T.2A”. Although RAF Jaguars were originally delivered with the Adour 102 engines, within a few years the British aircraft were refitted with the more powerful Adour 104, providing 35.8 kN (3,650 kgp / 8,040 lbf) thrust. Several improvements were added in 1990, including upgrade of the Marconi RWR to Sky Guardian 200 standard, a much smarter piece of gear with a better threat-warning display; improvements in IFF and radio fit; and addition of an overwing launch rail on top of each wing for carriage of Sidewinder AAMs. The overwing launch rail was designed for the “Jaguar International” export variant, discussed below, and allowed carriage of AAMs without sacrificing heavy underwing stores. * RAF Jaguars thoroughly proved their worth in the Gulf War in 1991. They were painted in a very businesslike overall “desert pink” (actually sand) color scheme. The RAF had obtained two Vinten VICON 18 Mark 600 Long Range Optical Pods (LOROP) for reconnaissance in 1990 and these pods were used in the conflict. Over 600 combat sorties were performed by RAF Jaguars during the active air war, roughly the same number as AA Jaguar sorties. RAF Jaguars often carried CRV7 70 millimeter unguided rocket pods, as well US-built CBU-87 cluster bomb units, though since these were longer than the traditional British BL755 cluster bombs only one could be fitted on a pylon; two BL755s could be carried in tandem. No air-to-air kills were scored. It is interesting to wonder if the RAF and AA Jaguar pilots were inclined to certain camaraderie, in contrast to the sense of irritation, not always subtle, between the two countries over a joint development program that did not work as well as might have been hoped. * The RAF had intended to scale down the Jaguar force during the 1990s, but after the good showing of the type in the Gulf War the plans were reconsidered. Another major influence in the decision to hang onto the Jaguar longer was the persistent stretchout in the delivery date of the Eurofighter, the Jaguar’s intended replacement. The entire RAF Jaguar force was consolidated in three squadrons at RAF Coltishall in Norfolk, though the aircraft continued to be dispatched to trouble spots. RAF Jaguars served in helping police the “no fly zones” set up in Iraq, as well as in the various policing actions in the Balkans during the 1990s. A neat overall gray paint scheme was introduced late in the decade as the standard Jaguar colors. The RAF put considerable further effort into modernizing the Jaguar to keep it operationally effective. The first step in the series of upgrades took place in 1994, when the British Ministry of Defense issued an “Urgent Operational Requirement (UOR)” to fit a handful of the machines with the GEC-Marconi TIALD (Thermal Imaging And Laser Designation) 200 targeting pod, which had been shown to be a necessity during operations in Bosnia. TIALD included a “forward looking infrared (FLIR)” imager mounted in a turret with a laser target designator for target marking. The upgrade involved fit of the MIL-STD 1553B digital avionics bus; an improved HUD; a flat-panel head-down multifunction display (MFD) with dimensions of 12.5 by 12.5 centimeters (5 by 5 inches); and a hand controller to steer the TIALD turret. The Jaguars given this initial TIALD upgrade were given the new designation “GR.1B”, and went into action over Bosnia in the spring of 1995, generally performing “buddy designation” for RAF BAE Harrier GR.7s. Although the TIALD pod could be carried on an inboard wing pylon, with a fuel tank on the centerline and a laser-guided bomb (LGB) on the other wing pylon, it was judged more effective in Bosnia to carry a fuel tank on each inboard pylon, fit TIALD on the center pylon, and have other aircraft carry the LGBs. The “Jaguar 96” program brought the machine up to GR.1B standard, with TIALD support, the MIL-STD 1553B databus, the new HUD, and the hand controller (actually an improved version of that fitted to the GR.1B). However, the head-down display was not fitted to all Jaguar 96 upgrades.The Jaguar 96 upgrade also added a new “hands on throttle and stick (HOTAS)” stick top; and an improved nav-attack system that integrated the FIN 1064 with a Rockwell Collins Global Positioning System (GPS) receiver, plus a BASE TERPROM “terrain comparison” subsystem, which used a radar altimeter to obtain a terrain map and then matched the data to a library of known terrain. The terrain comparison scheme was similar to that used with the Tomahawk cruise missile.The TERPROM system also provided a “ground warning” capability, a useful feature for an aircraft that often flew at low level. A personal-computer-based mission planning system was used to define mission data for a particular sortie, with the data then downloaded to the Jaguar in a plug-in module. The “Jaguar 97” program was defined as something of a superset of the Jaguar 96 upgrade, with a larger head-down color MFD, spanning 20 by 15 centimeters (8 by 6 inches); an improved map generator system, TERPROM, and mission planning system; a cockpit layout compatible with night vision goggles (NVGs); and in particular support of a “helmet mounted sight system (HMSS)” built by a collaboration between GEC-Marconi and Honeywell.The HMSS could be used to “cue” weapons for attacks on targets off the aircraft’s line of flight, and also provided cues for the aircraft navigation system. The only visible difference between a Jaguar 96 and a Jaguar 97 was that there was a head-position sensor for the HMSS in the middle of the canopy. The first Jaguar 96 upgrades were delivered in 1997, with the first Jaguar 97 upgrades delivered in 2000. By this time, the Jaguar 96 had been designated the “Jaguar GR.3” and the Jaguar 97 the “Jaguar GR.3A”. Jaguar T.2s were also refitted to some variation on Jaguar 96/97 standard, though the exact fit of the two-seaters remains a bit unclear. The two-seaters were redesignated “Jaguar T.4”. RAF pilots were extremely happy with the new capabilities, which they felt made the Jaguar a significantly more effective combat aircraft. * The RAF had further plans for Jaguar updates, under the “Continuous Technology Improvement Program (CTIP)”. CTIP was to add new features on an ongoing basis. Plans were set for qualification of new stores, most significantly the BAE “Advanced Short Range AAM (ASRAAM)”. ASRAAM is an “off-boresight” missile, meaning that the pilot doesn’t have to point the entire aircraft at a target to get a missile seeker lock. The pilot instead “cues” the missile to a target with the HMSS. Another update effort was to replace the Adour 104 engine with the improved Adour 106, which used the core of the Adour 871 fitted to the US Navy’s T-45 Goshawk trainer, the afterburner of the export Adour 811, and a digital engine control. The Adour 106 provided simplified maintenance, enhanced reliability, and about 6% more thrust. The Adour 106s were rebuilds of Adour 104s and were not new production engines. The engine update was being performed even though the Jaguar was planned to be out of service by 2008, since the Adour 104 engines were proving a major headache. However, in the summer of 2004, the British government decided to accelerate retirement of the Jaguar, with all Jaguars out of service by the end of 2007. There were protests over this decision since the Jaguar had proven a very effective combat aircraft, but the type was hardly being cut down in its prime, having remained in service and in good fighting trim long after it had been expected to be retired. Nobody could protest too loudly if retirement was moved up a year or two, though certainly a lot of people were sad to see such a fine machine go. * Even before the Jaguar entered full production for the AA and the RAF, the SEPECAT group had been considering an export version of the type, which became known as the “Jaguar International”. However, like almost everything else in the Jaguar story, things didn’t work out quite as neatly as expected, since Breguet was bought out by the Dassault firm in 1971. 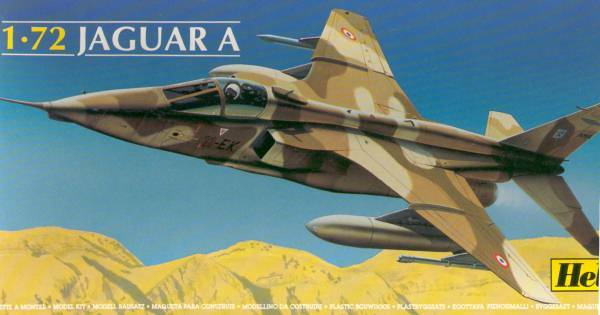 Dassault worked hard to sell their Mirage F1, which was surprisingly similar to the Jaguar in many ways, and had no interest in selling the Jaguar — and so the Jaguar International program basically fell into BAC / BAE’s lap, with the British concern finally obtaining full rights for export sales from Dassault in 1980. The failings of the collaboration with the French over the Jaguar apparently left many British defense and aerospace officials with a bad taste and suspicions of any further such arrangements with the French. When discussions over a European “fourth-generation” fighter came up in the early 1980s, it was no great surprise that the French went their own way, with the Dassault Rafale fighter, while the British collaborated with Germany, Italy, and Spain on the Eurofighter. Incidentally, the British did get some satisfaction over the fact that in the competition for international sales between the BAE Hawk and Dassault-Dornier Alpha Jet trainers, the Hawk would eventually win hands down. In any case, the first Jaguar International development aircraft performed its first flight on 2 September 1975. The Jaguar International was modeled on the British Jaguar GR.1 / T.2, instead of the French Jaguar S / E. The initial powerplant was the Adour 804, an internationalized version of the Adour 104. Avionics fit that varied with customers but was generally a subset of RAF avionics, with the “chisel nose” for the LRMTS and the prominent RWR antenna on the tailfin. SEPECAT offered an option for fitting Agave radar in the nose of the Jaguar International to allow the fighter to carry and control the BAE Sea Eagle antishipping missile on the centerline pylon; the LRMTS was relocated to a fairing under the nose. The Agave could pick up a vessel at a range of 130 kilometers (80 miles) and was initially trialed by being fitted into a modified drop tank. Production Jaguars with the Agave radar had a distinctive extended “pointy nose” with no pitot tube that immediately distinguished them from any other single-seat Jaguar variant. They were the only Jaguars fitted with combat radar. Weapons carriage was also generally similar to that of British Jaguars, with several customers buying the BL755 cluster bomb as a important store. 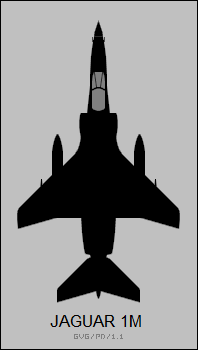 The Jaguar International could be fitted with the overwing pylons, mentioned above, for carriage of heat-seeking AAMs, allowing all underwing pylons to be used for heavy stores. The usual overwing munition was a Matra Magic AAM, though the Sidewinder was also qualified eventually. Although it might seem that overwing launch would have led to problems with stores separation, it apparently was no big deal. * The Jaguar International was purchased by four countries: Ecuador, India, Nigeria, and Oman. India was by far the most enthusiastic foreign user, and the relatively complicated history of the Jaguar in Indian service is discussed separately below. Ecuador, along with Oman, was one of the first customers, ordering ten Jaguar ES single-seaters and two Jaguar EB two-seaters in 1974, with deliveries in 1977. Officially speaking, they were actually the “Jaguar International ES” and “Jaguar International EB”, but in the interests of simplicity the “International” will be dropped in the following text, though it applies to all new-build Jaguars supplied to the four foreign users. They were flown in early RAF-style camouflage, with dark green and dark gray on top and light gray on the bottom. The Ecuadorian Air Force liked the Jaguar very much, ordering three attrition replacements in 1991, all three being ex-RAF Jaguar GR.1s that were refurbished by BAE. Several other attrition replacements may have been ordered since then. * Nigeria ordered 18 Jaguars in early 1983, with the order consisting of 13 Jaguar SN single-seaters and 5 Jaguar BN two-seaters. They were delivered beginning in 1984 and featured a pleasant dark green / sand / tan camouflage scheme. The Nigerian government also took an option on 18 more Jaguars, to include six with Agave radar, but as it turned out not only did Nigerian drop this option, the government also withdrew the survivors of the first batch in the early 1990s due to budgetary problems. * Oman ordered 12 Jaguars in 1974, including 10 Jaguar OS single-seaters and 2 Jaguar OB two-seaters. Deliveries were in 1977 and 1978. Oman ordered a second, identical batch of 12 in 1980, with deliveries in 1983. The two trainers in the second batch were unusual in featuring the ARI 18223 RWR and being fitted with French-style fixed flight refueling probes. An ex-RAF Jaguar T.2 was also delivered in 1982, followed by an ex-RAF Jaguar GR.1 in 1986. The GR.1 was actually one of 16 that had been loaned to the Indian Air Force, and it was delivered straight from India to Oman. Omani Jaguars were all painted in a brown / sand desert disruptive camouflage scheme. Overwing launch rails were originally fitted, at least to the single-seaters, for carriage of the Matra Magic AAM, but for some obscure reason the Omanis decided to switch to carrying AIM-9P Sidewinders on the outboard underwing pylons. Oman actually assigned its Jaguars an air-defense role. 21 Omani Jaguars were upgraded with the FIN 1064 nav-attack system from 1986 into 1989, bringing them up to GR.1A standards. The last of them was finally retired in 2014. * India had made inquiries about the Jaguar beginning in 1966, very early in the program, seeing the type as a potential replacement for increasingly antiquated Indian Air Force (IAF) English Electric Canberras and Hawker Hunters, with the requirement given the designation of “Deep Penetration Strike Aircraft (DPSA)”. The selection process went on for 12 years, with India also considering the Dassault Mirage F1 and SAAB Viggen, but finally chose the Jaguar International in October 1978. The British must have been pleased to trump the Mirage F1. The IAF was in such a hurry to get Jaguars that, as mentioned above, the RAF loaned the IAF 16 GR.1s and two T.2s in the summer of 1979. These were referred to as “Batch 1 / Interim” machines. Two of the “loaners” would be lost in IAF service, but the others would be returned in 1982 and 1984. Ten of the survivors went back into RAF service, one went to Oman as mentioned, and the other three were scrapped. By that time, the IAF had received 40 “Batch 2” machines, all built in the UK, including 35 Jaguar IS single-seaters and 5 Jaguar IB two-seaters. The Jaguar IS was very similar to the RAF Jaguar GR.1, with Adour 804E engines and the NAVWASS system, though it did have overwing launch rails and carried Matra Magic AAMs. The IB was very similar to the RAF Jaguar B. The Jaguar was known as the “Shamser (Sword of Justice)” in IAF service. There were some teething problems with these machines, most particularly landing gear failures that led Hindustan Aircraft LTD (HAL) of Bangalore, India, to perform an upgrade on the Batch 1 / Interim and Batch 2 machines. Apparently BAE then used this same fix on RAF Jaguars without compensating HAL, leading to a legal dispute that was settled out of court. The Batch 2 aircraft were to be followed by “Batch 3” machines, produced by HAL, beginning with kits supplied by SEPECAT, but then with increasing local content. The local production deal almost fell through due to a change in governments, but the political problems were resolved. The first Batch 3 machines went into IAF service in 1985. A Smiths Industries / GEC “Head-Up Display / Weapons Aiming Computer (HUDWAC)” system, used on the BAE Sea Harrier and featuring a wide-field HUD. A GEC-Ferranti “Combined Map & Electronic Display (COMED)”, used on the McDonnell Douglas F/A-18 Hornet. A French SAGEM ULISS 82 Inertial Navigation System (INS). The system elements were integrated in India. Other avionics kit, such as radios, IFF, and automatic direction finder, was of Indian origin. Local Indian production of the Jaguar is something of a confusing and tedious topic, with sub-batches of machines being delivered on an on-and-off basis. By the end of the century, an approximate total (sources vary) of 91 HAL-built Jaguars had been delivered, including 69 IS single-seaters, 10 IB two-seaters, and 12 “Jaguar IM (India Maritime)” single-seat antishipping aircraft, with the Agave radar and the BAE Sea Eagle antishipping missile. The LRMTS was not fitted to the Jaguar IM. Along with the 40 British-supplied machines, that gave a total of 131 Jaguars obtained by India in the 20th Century, not counting the 18 loaners. * Most IAF Jaguars were originally painted in dark green / dark gray camouflage, though the Jaguar IMs were painted in a light gray / dark gray camouflage. The IAF has now adopted a standard overall light gray color scheme for all Jaguars, similar to that adopted earlier by the RAF. Indian Jaguars carry a wide range of ordnance, including dumb bombs, cluster bombs, SNEB unguided rocket pods, and Matra Durandal “runway breaker” bombs. IAF Jaguars have long carried the Sea Eagle antiship missile, but it is getting elderly and is being replaced by the US Harpoon Block III antiship missile. The IAF also obtained a number of BAE centerline reconnaissance pods for their Jaguars, and later acquired more modern Vinten reconnaissance pods. In recent years, as India has acquired a nuclear strike capability, the Jaguar is believed to be the primary platform for delivery of free-fall nuclear weapons. Another rumor is that IAF Jaguars have been given a low-cost “stealth” upgrade — featuring such simple items as anti-radar engine intake screens — that cuts their radar cross section by more than half. * The IAF is still obtaining Jaguars. In 1998, an order was placed with HAL for 17 Jaguar IB two-seaters. Initial deliveries were supposed to be in 2001, but some problems with avionics systems slipped deliveries out to 2003. These two-seaters were built to a fully combat operational standard for night attack, featuring the LRMTS along with a modern combat avionics system with new displays and a navigation system with a ring-laser-gyro INS and a Global Positioning System (GPS) satellite navigation receiver. They carry the Israeli Rafael Litening targeting pod, which features a daylight CCD camera, a FLIR imager, and a boresighted laser. The back-seater works as a “weapons system officer” to direct precision-guided munitions while the front-seater flies the plane. The new aircraft are also NVG compatible. In addition, the IAF has ordered 20 more Jaguar IS single-seaters, with an improved nav-attack system and modernized displays and processor. Similar avionics systems are also being refitted to older Jaguars, a welcome upgrade in particular for the surviving British-built Batch 2 aircraft since they retain the original NAVWASS system. Ten Jaguar IMs, apparently all that remain in service, are to be refitted with an improved Israeli Elta EL/M-2032 multimode radar. Hindustan Aerospace has also developed a comprehensive “DARIN III” avionics updated for the Jaguar fleet, with new instrumentation, mission computer, autopilot, modernized GPS-INS navigation system, radar, and radar warning receiver. First flight of a DARIN III Jaguar was in late 2012. Additions to kit and heavier payloads has increased the weight of the Jaguar, and the IAF has a requirement for re-engining the Jaguar fleet to provide better “hot & high” performance. The current candidate is the Honeywell F125N afterburning bypass turbojet, though Rolls-Royce has also proposed the updated Adour 821. Another program in process is to provide a modern self-defense AAM, with the candidates being the MBDA Advanced Short Range AAM (ASRAAM) and the Rafael Python 5. Still more improvements are believed to be in the works, such as increased cockpit automation to allow single-seaters to carry and use the Litening targeting pod, as well as new AAMs and other munitions. Given the new production and the improvements to older aircraft, it seems like the Jaguar will remain in IAF service for a good time to come, a tribute to the basic soundness and capability of the design. * To an American, the whole story of the origins of the Jaguar gives some interesting insights into the odd mix of cooperation and antagonism between the British and the French — though I suppose the relationship between the Americans and the Japanese has a lot of similarities. It also gives a flavor of the somewhat roundabout way the English tend to do things, which baffles Yanks, who are inclined to straight-line, brute-force, and sometimes simplistic ways of thinking. It baffles us all the more to find out that it actually works out very well in some cases. The Jaguar is an excellent example. * I was lurking on aircraft forums online one day and somebody mentioned the fact that the Jaguar had started life at least partly as a trainer for the RAF; had it actually been adopted as part of the RAF’s training curriculum, that would have likely meant it would have become the mount for the RAF Red Arrows flight demonstration team. The idea is one of the little interesting bits of the history of aviation that never actually happened. “SEPECAT Jaguar” by Paul Jackson, WORLD AIR POWER JOURNAL, Volume 11 / Winter 1992, 52:111. “Towards A Super Jaguar” by Jon Lake, COMBAT AIRCRAFT, October-November and December 2000. “The Jaguar Sharpens Its Claws” by Jon Lake, AIR INTERNATIONAL, December 2000, 356:360. “Jaguar In India” by Jon Lake, AIR INTERNATIONAL, December 2001, 344:347. 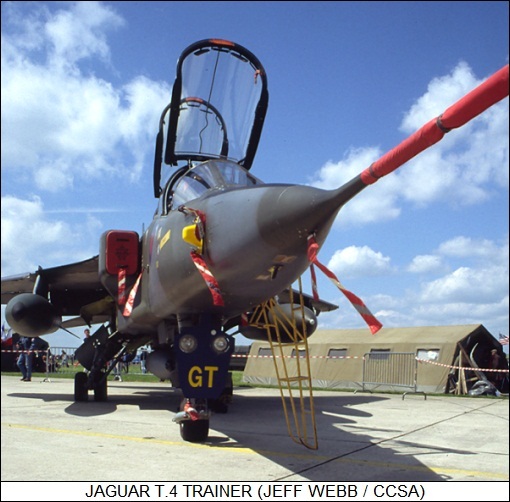 “Planned Jaguar Withdrawal Poses RAF Capability Headache” by Douglas Barrie, AVIATION WEEK, 18 February 2002, 61.
v1.0.1 / 01 sep 05 / Review & polish. v1.0.2 / 01 aug 07 / Review & polish. 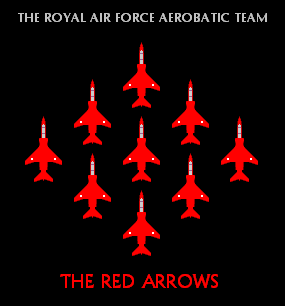 v1.0.3 / 01 apr 08 / Added Red Arrows Jaguars. v1.0.4 / 01 mar 10 / Review & polish. v1.0.5 / 01 feb 12 / Review & polish. v1.0.6 / 01 jan 13 / Clarified lengths, Harpoons on IAF Jaguars. v1.0.7 / 01 dec 14 / Omani Jaguar retirement. Thank you for a great site. What a wealth of information about the Jaguar! What ever happened to the Jaguar M prototype? There is one other possible reason for the cancellation of the Jaguar M in favour of the Super Etendard. The spool-up time for the 2 Adour turbofan engines of the Jaguar M was long for a carrier aircraft responding to a bolter (hook misses all arresting wires). Typically turbojets spool-up significantly faster than turbojets. If true, that would be an on-going day-to-day concern even more than the alleged deficiency in single engine out performance for the Jaguar M.
In this kit of Heller http://sepecat.info/kit/kit-17.jpg there are three desert colors. Do you know which colors are? This is NOT true. The final French Jaguars, from EC 1/7, were retired on 1 July 2005.